A Boycott For Cath Kidstons Pop Up Shop.. This is a bit raw for their FaceBook page, someone has hit a nerve. Read this article in the HT, I now see why. Me too, not that Coco is the type of shop I would shop in, but I wish them luck. Appears to look a little unfair on the surface. I would guess that Coco never discussed being an exclusive outlet for the Cath Kidston range for Hereford City Centre when they placed the order. It does seem a bit unfair tho that the Old Market people have verbally agreed a deal with Coco and then apparently gone back on it. Does anyone know if there are other existing third party outlets for Cath Kidston in Hereford ? I wouldn't know as I don't purchase that sort of stuff. I think in a funny sort of way this could be a win/win for everyone involved. Excellent marketing by Coco, they have turned a bad situation possibly into a good one by letting a large number peope know they have a large range of Cath Kidston stock in and that they have been treated unfairly. An article in the Hereford Times and facebook/Hereford Voice have helped them advertise this for free to potential customers! 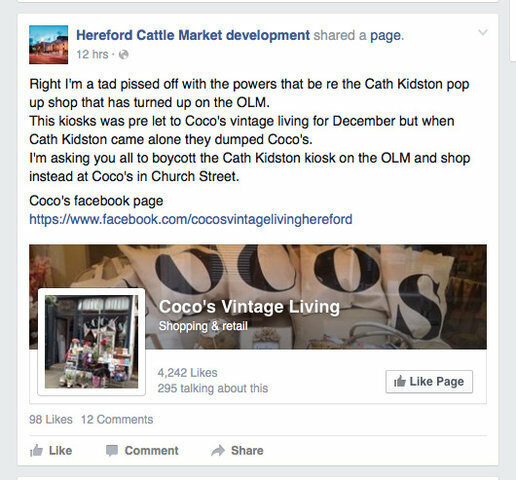 There is a strong community in Hereford so they will no doubt sell a large amount of their stock because of this. . But the development have to think of their shoppers/customers first, . Best of luck to all of them!